Former Dean and Professor Ted Parnall with ADALAT colleagues and professors from Bost and Nangahar Universities. Former UNM Law Dean and Emeritus Professor Ted Parnall recently completed his seventh visit to Afghanistan, continuing his work with the USAID-funded Assistance for the Development of Afghan Legal Access and Transparency (ADALAT) Project implemented by the Washington D.C. based Checchi and Company Consulting, Inc.
Checchi and Company has worked to support law development in Afghanistan for many years, and, with its current ADALAT Project, seeks to achieve its main purpose by advancing three specific sub-purposes: increased effectiveness and reach of the formal justice sector, strengthened linkages between the formal and traditional justice sectors, and increased citizen demand for quality legal services. The ADALAT Project is in place to improve the quality of legal services for Afghan citizens by working directly with entities like the Afghan Supreme Court and Afghanistan Independent Bar Association to improve the quality of professional training and legal education for judges and lawyers, in addition to working with a number of civil organizations to improve citizens’ awareness of their legal rights and resources. Adalat is also the word for justice in one of Afghanistan’s main languages. Professor Parnall’s recent work has been focused on the efforts to address improvement in the quality and access to legal education. ADALAT’s activities in this area primarily involve supporting private university law faculties in improving their curricular offerings (including increased integration of the clinical legal education method into the curriculum), strengthening their teaching methods and strengthening the teaching of practical lawyering skills. Before departing, Parnall received some significant insight to bring to the endeavors in Afghanistan from colleague Professor Scott England, a Principal Lecturer in UNM Law’s Legal Analysis and Communication Program. England provided Parnall with a useful overview and update on how the UNM School of Law is currently teaching legal analysis, writing and oral advocacy to its students here in New Mexico. 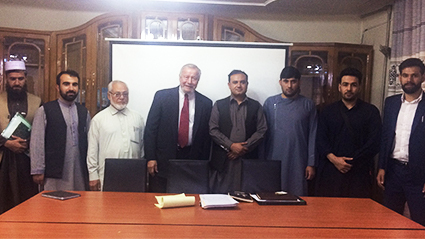 During his June visit, Professor Parnall met with Afghan experts in law clinics and curricular reform, as well as approximately 30 persons representing five potential grantees of the ADALAT’s grants to encourage practical legal skills and clinical education. These grants are intended as a complement to other efforts now being made under the auspices of the Ministry of Higher Education to reform Afghan legal education. Despite on-going security concerns, Parnall was pleased with the progress made and the work done with his Afghan colleagues. As a result of the cooperative efforts, he developed a program to support both pre-clinic skills courses and the initiation of law clinic at each of five universities located in Kabul, Herat, Nanghahar and Helmand provinces. Two Pre-clinic courses are scheduled to take place between August and December of 2018. These courses are about developing and explaining legal analysis, and beginning to prepare a group of students from each grantee to perform services as lawyers before joining the Law Clinic scheduled to operate from December 2018 until March 31, 2019. In other courses at the university, students have learned the theory or doctrines of the legal system, but in these two interrelated “pre-clinic” courses, they will learn how to apply and use these doctrines and theories in order to assist clients, whether using traditional justice institutions, and/or the courts. The Pre-Clinic instructors in both the Clinical Legal Writing and Clinical Advocacy courses intend to help them learn legal argumentation through improving their legal analysis and communication skills. The ADALAT grants will also support the operation of a Law Clinic at each of the grantee institutions. The Law Clinic course, limited to a small group of students at each grantee, allows them to work under the supervision of a practicing lawyer to obtain knowledge and experience in the practice of law. Students will have the opportunity assist their supervising lawyer/instructor to interview and counsel clients, assist in negotiations with lawyers and others, make presentations in traditional justice settings and or courts, draft legal documents, and interview witnesses. These students will develop their own practical lawyering skills by assisting their lawyer/instructor in various tasks necessary to help clients resolve their legal problems. Parnall said that he drew heavily not only on his own background working in many other countries, such as Indonesia, Egypt and China, but also on the extensive emphasis the UNM School of Law has placed on its mandatory clinical legal education program. “At least since 1970, the UNM School of Law has been a leader in Clinical Legal education, and this was initially encouraged by grants from the Ford Foundation under the leadership of William (Bill) Pincus. Using Professor England’s input on what we are currently doing with our legal writing curriculum, I tried to adapt some of our experience and practices in legal writing and clinical legal education to the very different Afghan conditions. I am sure that Fred Hart, Tom Christopher, and Bill Pincus are, or would be, surprised to see the far reaching potential impact of their vision”, shared Parnall. For more information on former UNM Law Dean and Emeritus Professor Ted Parnall, please click here. For more information on Checchi and Company Consulting, Inc. and the ADALAT Project please visit their website.